LECOM Health and LECOM Medical Fitness and Wellness Center introduced a new Millcreek Mall walkers program. The LECOM Walk for Wellness is a 1.2 mile route through the mall with fitness stations where walkers can exercise. ging, LECOM Health is excited to launch this health and wellness program in collaboration with the Millcreek Mall. 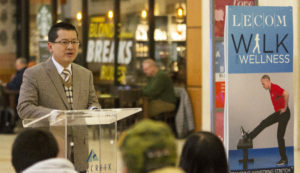 Dr. James Lin introduces the LECOM Walk for Wellness at the Millcreek Mall. The Walk for Wellness includes eight fitness stations with exercises designed by the fitness experts from the LECOM Medical Fitness and Wellness Center. Participants in the free LECOM Walk for Wellness may attend monthly health education programs presented by physicians from Medical Associates of Erie, an affiliate of LECOM Health. Programs will cover topics designed to keep walkers healthy as they learn about heart health, women’s and men’s health, colon cancer, cataracts, and diabetes among other topics. Cardiologist Carmine D’Amico, D.O. will present the first talk at 8 a.m. on Tuesday, Feb. 13. Current mall walkers and those interested in becoming mall walkers may register for the program and take advantage of free screenings, health information, giveaways and refreshments. All walking levels are welcome. More information is available at (814) 868-9000.